In business for over 40 years, Studio West has recorded artists such as blink-182, Boyz II Men, Cowboy Junkies, Jewel, Ike Turner, Frankie Laine, Patti Smith, and Queens of the Stone Age. In addition to music, its client list includes film, TV and video post-production work, including film scores for The Usual Suspects and The Cable Guy and sound design for the video games Iron Man 2, Thor, and Captain America. 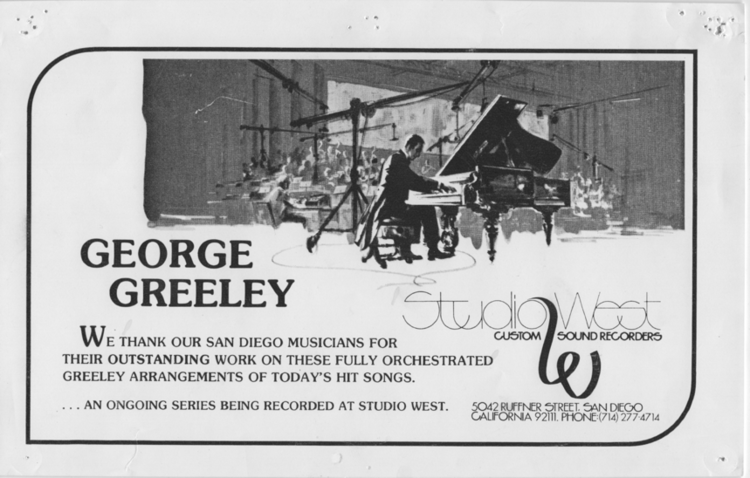 Studio West opened its doors in the Clairemont Mesa area in 1971 back in the days of analog technology. In 1986, the studio moved to the Rancho Bernardo area, where it has been expanded and updated to keep up with our digital times. Our 8,000 square-foot facility features three world-class recording studios that complement each other in form and function, allowing our clients the freedom to take a project from inception to completion in a cost effective and efficient manner within an environment that provides total support for the creative process. In 2004, Peter Dyson acquired Studio West with a vision to build upon the studio's rich history by developing a world-class music production school. In 2005, Peter expanded the facility to accommodate classrooms featuring individual work stations loaded with industry-leading software such as Pro Tools. In August of 2006, The Recording Arts Center was launched and conducted its first Pro Tools classes. The curriculum expanded from there to include courses in audio engineering, mixing & mastering, electronic music production, video production and live sound. The Recording Arts Center has quickly gained a national reputation for quality. Avid selected The Recording Arts Center to be one of only a few schools in the nation to teach classes on its VENUE live sound systems. As an Avid Learning Partner, students can earn Avid’s Pro Tools, Media Composer, and VENUE industry certifications. Students can also earn an Associate Degree in Recording Arts, which will prepare them for a wide variety of careers in the audio and video production industries. The Recording Arts Center’s location within a real, working studio is one of its main advantages. Students learn in an environment where real projects in music, TV, film, video games, and radio are recorded every week. The Recording Arts Center is proud of its reputation for excellence, and plans to keep hold of its commitment to quality as it continues to grow. In 2014, Studio West began teaching music production to middle school and high school students. What started with a single week-long workshop has grown into our vastly popular summer camps that grew to 6 camps in 2016. In 2016, the youth programs expanded to include a year-round after-school music production workshop and individualized training in areas such as Logic and Ableton. Studio West and The Recording Arts center continues to expand and adapt its studio services and educational programs to keep pace with the evolving needs of a rapidly-changing digital world. All the while, with the same commitment to quality that has made us the leading recording studio and music production school in San Diego. "Since attending The Recording Arts Center the world opened new doors for me. Before I came to Studio West I really had no formal training. Studio West’s reputation helped me get my foot in the door. I now work in film, including sound editing and sound design for shorts and indie films."